HMD Global has announced its new Nokia line of handsets in the Philippines. Specifically, the Nokia 7 Plus, Nokia 6 (2018), Nokia 1, and Nokia 8110 4G will be made available in the country. The Nokia 8 Sirocco flagship with a curved display? Well, it didn’t show up on stage, as we expected, but we’re still crossing our fingers for a domestic release sometime soon. That aside, today’s been a good day for locals who are still interested in what the iconic mobile brand has to offer. Let’s start with the most exciting reveal of the day. The Nokia 7 Plus is an Android One smartphone for power users who are after a better-than-average stock Android experience but aren’t happily willing to go the Google Pixel route. The capable Qualcomm Snapdragon 660 processor inside its machined-aluminum housing will tie things together nicely, especially with secure and up-to-date Android Oreo on tap. The dual back-facing cameras with Carl Zeiss lens suggests this unit could do wonders with the proper lighting, whereas the 16-megapixel camera with f/2.0 aperture on the front should provide clear and crisp selfies on most occasions. Also on the front is a 6-inch touch display with a taller aspect ratio of 18:9. The Nokia 7 Plus will be available from April 27 for P21,990 (around $423), about the same price as the one we saw on Shopee Philippines on April 10. There are two color options available — black and white with copper accents. Say hello to the cheapest Nokia-branded Android smartphone. The Nokia 1 is an entry-level offering positioned as a no-frills upgrade for feature-phone users. As expected, it comes with a small 4.5-inch display and pairs a lowly MediaTek processor with 1GB of RAM and 8GB of expandable storage. The cameras on the front and back are par for the course for a device of this type. The good news is that the Nokia 1 has Android 8.1 Oreo (Go Edition) preinstalled, so users can expect pretty much all the new features of the regular Android Oreo OS on tap. By extension, apps optimized for the Go Edition of Android are expected to run well in spite of the limited internals. HMD also says users can customize the handset thanks to swappable back covers that ship with it. In the Philippines, the Nokia 1 — as we at Revü spotted on April 7 — is priced at P4,290 ($83). You can buy it starting today, April 13. 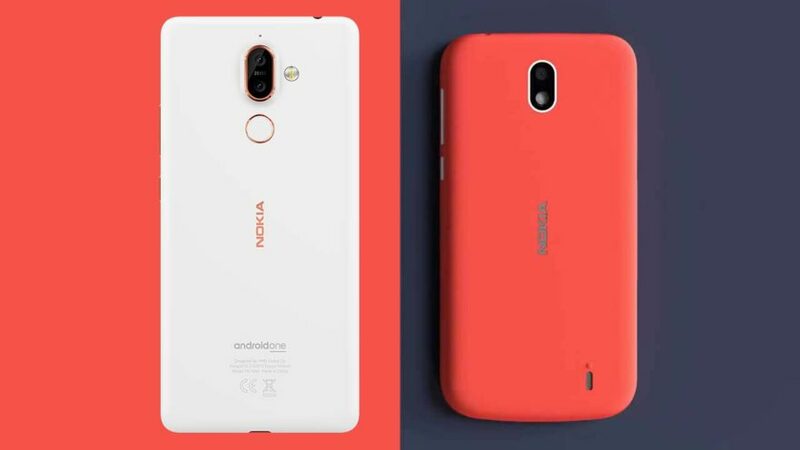 The Nokia 6 (2018), as you might have gathered, is the direct sequel to last year’s Nokia 6. The newer version is once again made out of aluminum, but this time round it has undergone a little makeover, sporting metallic accents around its Zeiss optics and flash module, as well as on the sides. Stepping up from Qualcomm’s Snapdragon 430 chipset, the Nokia 6 (2018) sees the Snapdragon 630 ticking under the hood. HMD has coupled the mid-market processor with 3GB or 4GB of RAM and up to 64GB of built-in storage. If we could change anything about the hardware, it would come down to the aspect ratio. We would have wanted a wider display than what we have now. The Nokia 8110 4G, on the other hand, is a remake inspired by the “banana phone” from Nokia’s back catalog and the 1999 movie The Matrix. It has a curved body; a keypad behind a mechanical slider; and a puny display running a custom operating system that has access to Google and Facebook. Pricing and availability details for the new Nokia 6 and Nokia 8110 4G have yet to be finalized. However, they could go on sale as early as May, we’re told.